CJ SHEERAN can offer significant savings to customers through our reconditioned pallet offerings. As Ireland’s largest used pallet recovery operator, recovering in excess of 1.5m pallets per annum, we have both the type and volume to meet all applications. 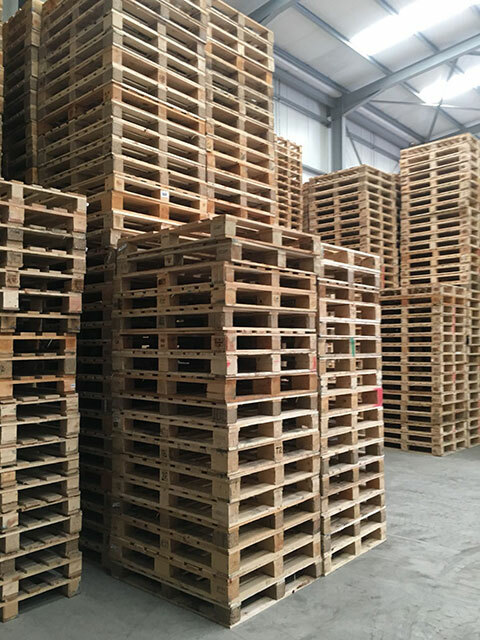 Our reconditioned pallet offerings are subjected to our rigorous QC procedures and are 100% inspected, providing our customers with that critical quality assurance. We also offer a barcoding service, ensuring traceability throughout the supply chain. Consumers of reconditioned ISPM15 heat-treated pallets should always ensure that their pallets are sourced from a reputable supplier registered to the ISPM15 standard. If a previously treated ISPM15 pallet is subjected to any repair work, Ireland’s application of the IPPC rules insist that the full module must be re-heat-treated as a whole and restamped to ensure compliance with the ISPM15 scheme. Non-conforming ISPM15 pallets can have devastating consequences from rejected shipments at ports to damaging entire forests and ecosystems. CJS are an approved repairer of ISPM15 pallets and can provide you with an assurance of compliance. Contact us now to discuss your reconditioned pallet requirements.